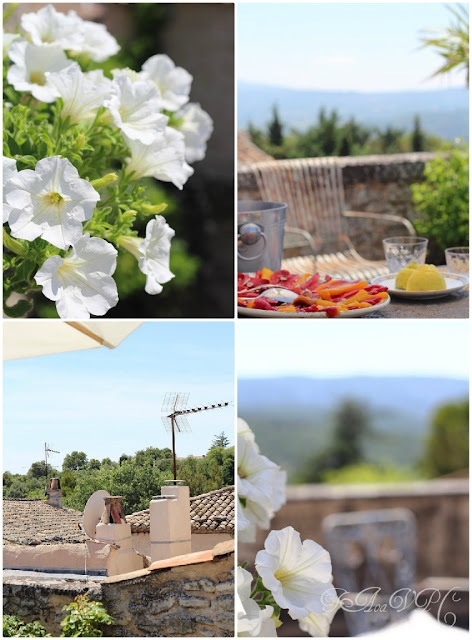 What I do really like here in Provence is that people take the time for living . 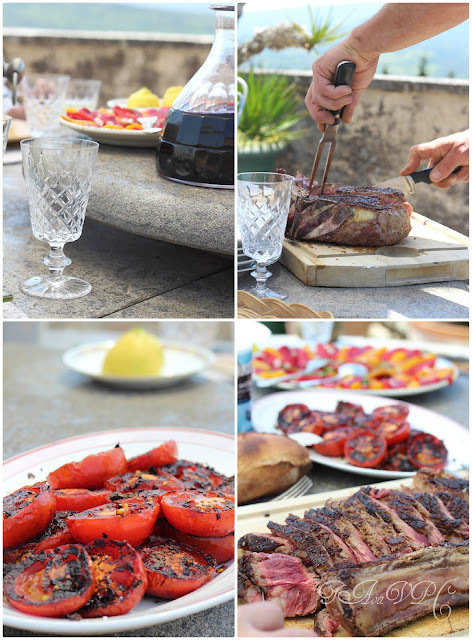 So , you don't need to wait for the Weekend to be invited somewhere or to invite someone .It was just a thursday like any other and our neighbours invited us for lunch : a magnificent steak was cooking on the barbeque when we arrived ,about 4lb of meat for three . It was a wonderful day and the view from their terrace looking towards the Luberon and onto the village is great. So we had tomatoes and peppers with the steak , then came cheese. Time flewed sweetly ,eating & chatting . I brought the dessert , a simple crumble with rhubarb and cherries . I made it very light , less butter and a small amount of sugar . Using rice and spelt flour instead of wheat ( I don't know why but wheat flour makes crumble rather heavy to digest for me ) and I used a special pepper to give a spicy touch . Preheat the oven at 180° or 375 F , butter a 20/22 cm baking dish ,or six single ones as I did and set aside. Wash the rhubarb and the cherries ,trim the top and the ends of the rhubarb and cut diagonally into 2 cm lenghts. Remove the stems and kernels from cherries . Sprinkle 1and 1/2 teaspoon of sugar on the dish ( or 1/4 on each if making individual portions) , spread the fruits evenly . To make the crumble topping put the flours ,the salt and the butter in a bowl , rub the butter till the mixture seems like breadcrunch , stir in sugar , pepper and almonds . 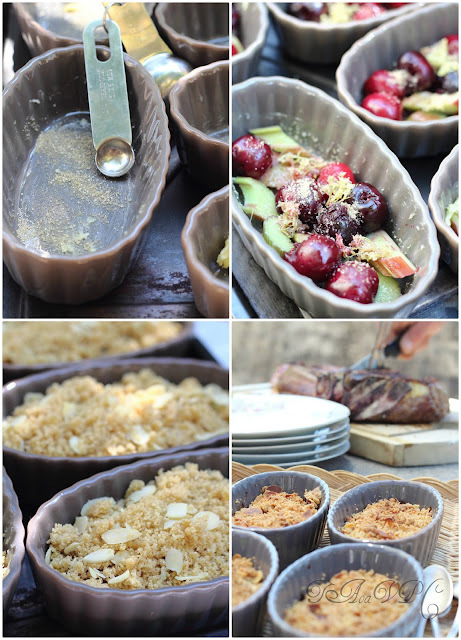 Sprinkle the crumble over the rhubarb and cherries , bake for about 25/30 minutes until the topping is golden brown . You can eat it warm but I like it even cold . Che bel pranzo! Aggiungi un posto a tavola! io ho provato il crumble con rabarbaro e fragole e mi è piaciuto moltissimo. Grazie per il tuo apprezzamento sulla ricetta del budino, mi ha fatto molto piacere. Oddio Giuseppina, l'atmosfera intorno a quel tavolo imbandito di meraviglie mi fa sognare. Quella bisteccona sembra cotta con tutti i crismi. Mio marito, the mad barbecue man, ti darebbe 10 e lode! Senti, ma era per i tuoi ospiti? E perché io non c'ero fra gli invitati? Questa me la lego al dito. 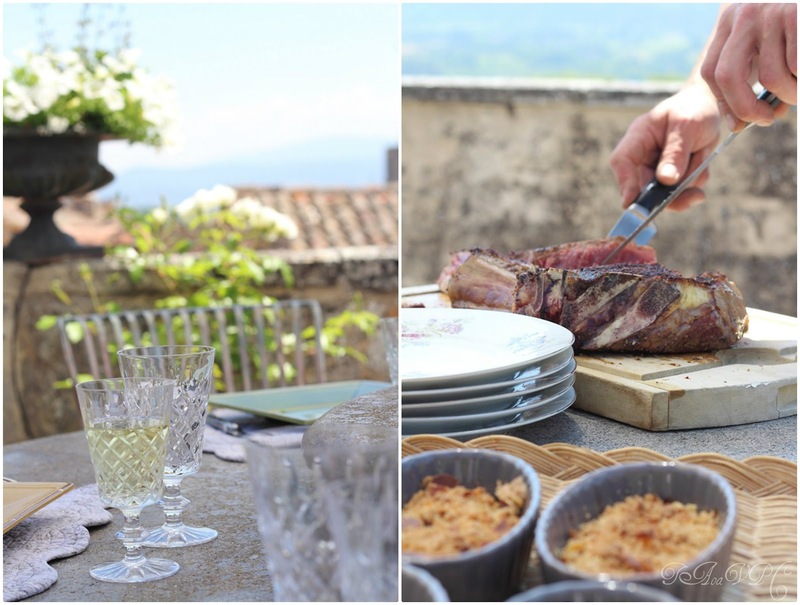 cara patty , non l'ho cotta io ,sai com'é ....affare di uomini ( magari l'avrei fatta un po meno bruciata :) e in effetti eravamo noi ad essere invitati , magari avessi una terrazza cosi ! pero per l'anno prossimo spero di poter cambiare casa e allora ti invito volentieri !!! io ti adoro, adoro le tue foto, le tue ricette, l' atmosfera, le sensazioni che trasmetti, le parole che scegli per raccontare la vita..
eppure, secondo me non te lo dico abbastanza (quanto ti adoro)!!!! Lovely photos! The steak looks amazing!